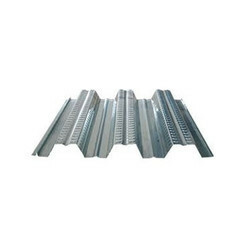 We are a leading Manufacturer of decking sheet and roof decking sheets from Mumbai, India. Decking Sheet offered features superior friction and shear support and comes with innovative rib design that provides for optimum usage support. These sheets also do not slip on application of loads. 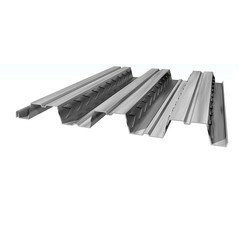 Some of its features include superior fire resistance, rib coming encased in concrete for lasting use, can be provided with fire-retardant coating support, excellent floor decking support, has greater effective height, provides for greater resistance to sagging, can be suitable for installation of ceiling, can be moved and reinstalled as required, east and fast to construct, flat slab appearance, can be provided in specifications. It is offered comes in durable and lasting construction finish and provides for easy installation as well as lasting usage values. Supporting the decking requirements better in comparison to traditional ways, the product also features flawless appearance. Some of its features include suited for use in high buildings, light weight finish in same loading capacity, environment friendly to use, anti flaming and water proof finish, ensures no cracking, provides for longer service life, low on maintenance and rotting among others. Our organization has gained huge reputation in offering Decking Sheet to our clients. These Decking sheet are reliable for long term usage and are build in an efficient manner by our quality experts mostly who are qualified technicians and engineers. With the help of our state-of-the-art infrastructure unit, we are able to provide superlative quality Roof Decking Sheets. Looking for Decking Sheet ?